Anyway, let's start at the beginning. I sent home this parent letter in order to inform parents of our upcoming trip as well as give them the words to practice at home. We did these worksheets pictured above and these ones here scattered throughout the month to work on our regular skills while including some fun fast food trip prep! 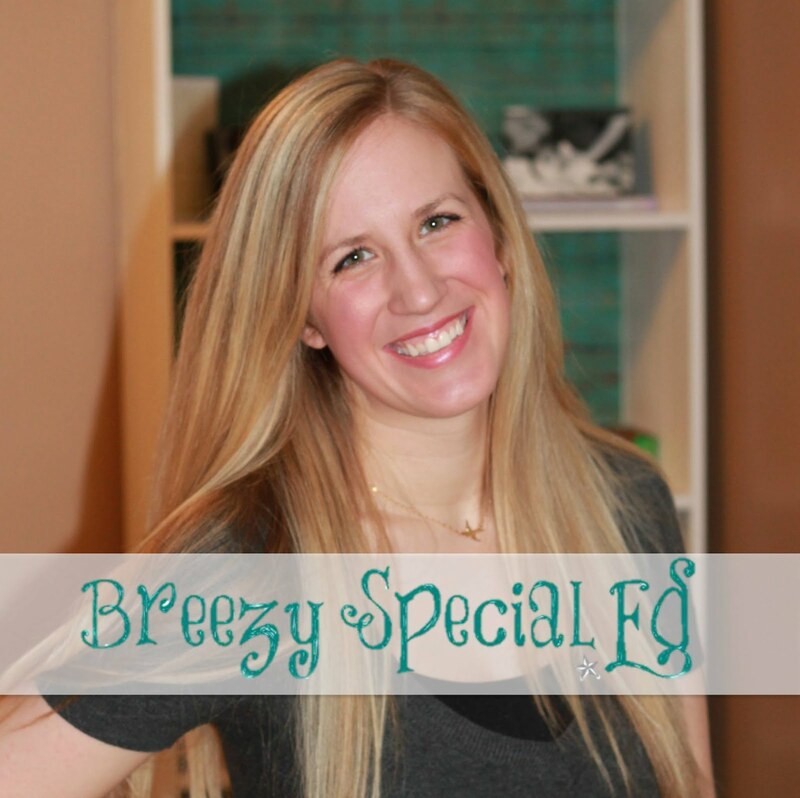 There are a few different ways I like to play this "game" with my students. 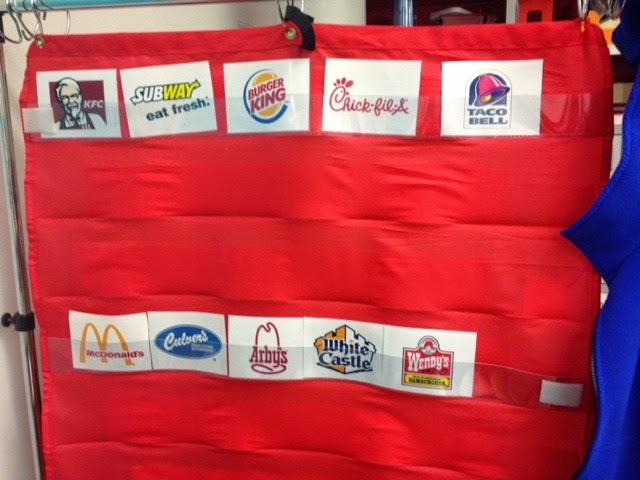 I usually introduce the activity as a class and give each student a red card (a couple students may have to share). I then read the yellow card and asks who has the right response. 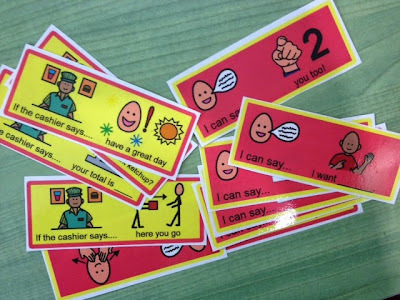 After going through all the cards like that, each student goes through these on their own and matches them appropriately. You can also do this activity without the red cards and the student actually has to respond like they would in that situation with the clues. The social story / coloring book is definitely my favorite part of my community trip materials. It goes through each step very simply and tells you what to do. We read this together as a class. I give directions like "color the tray green" in order to practice some following directions / listening skills. And we also practice and role play each step. We also played BINGO. I love Bingo, my kids love Bingo. It's a win-win all around! I store all of my Bingo boards in sheet protectors in a large binder. It's the best system ever. 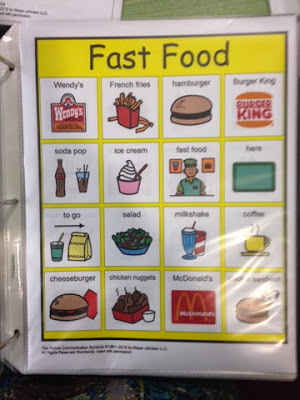 We also working on recognizing logos of other fast food restaurants using this adapted book and these flashcards. 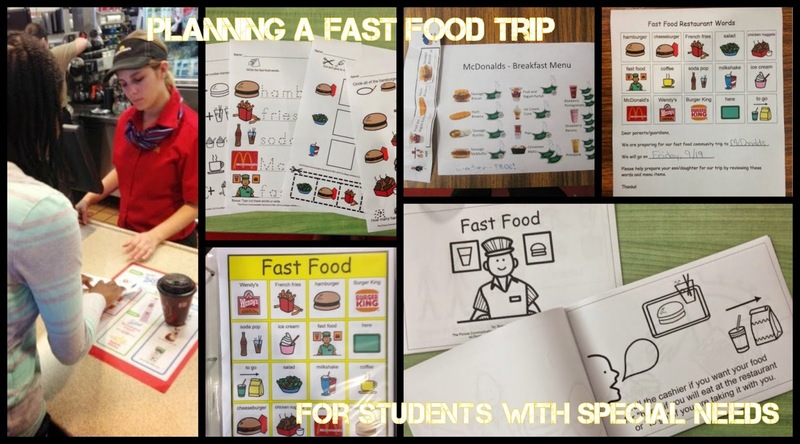 We did a lot of role playing and practicing ordering our food, as well as getting our money out of our wallets and handing it over to the cashier. 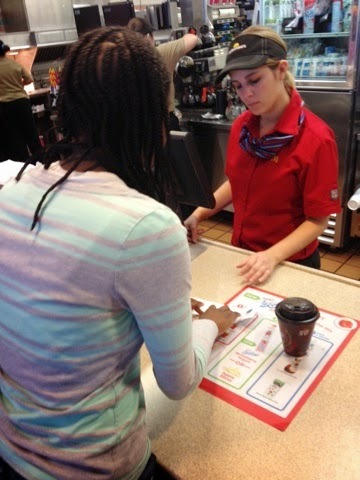 I tell my students if they can't order, they don't get to eat! We aren't going to do it for them, so they have to do it! We also had a countdown going on our calendar. Oh my, my class would be so excited and giggly whenever we were talking about that! 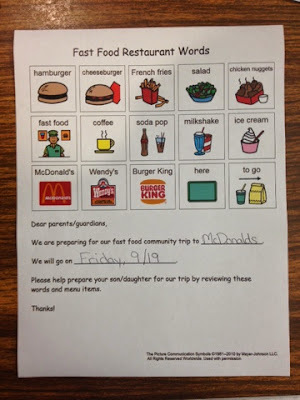 So, even though we spent all month working on saying and recognizing typical food at fast food restaurants like McDonalds....we had to order off the breakfast menu since our trip had to be scheduled in the morning! Since many of my students are non-verbal (and our iPads aren't loud enough to be used as communication devices in the community, I've tried), we used these sentence strips to order our food. 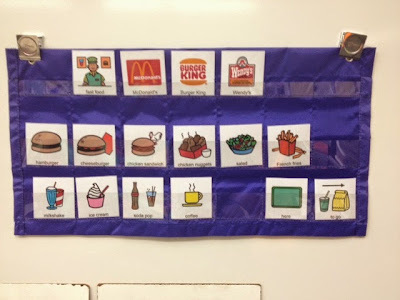 It was a great way to allow my students to be independent! 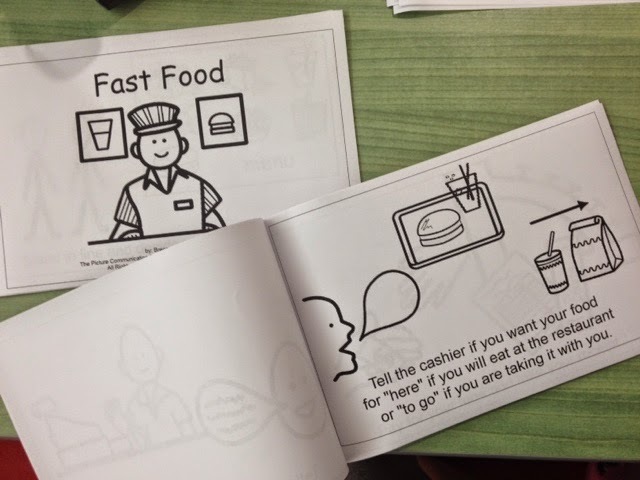 And look how well she's doing ordering her food with her sentence strip! 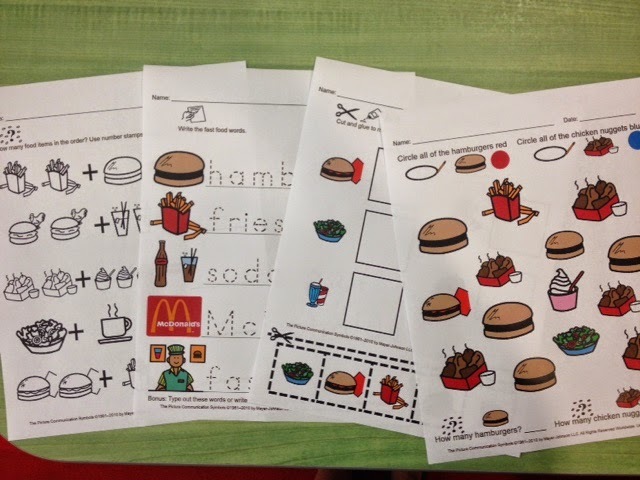 In case we have extra time after eating, I quickly created this scavenger hunt to go with the steps at McDonalds. You can download it for free here. I was so proud! I love a good, successful community trip! 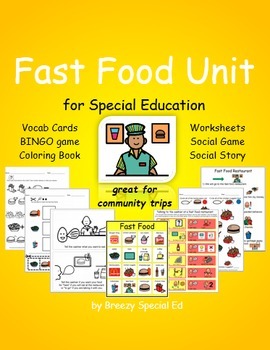 Get many of the resources mentioned above in this fast food community unit!